In 2001 when the Zetas compiled the Safe Locations document, they warned that Iowa would be virtually covered by water during the hour of the pole shift, severe flooding from rivers backing up and unable to drain. Lying between the Missouri and the Mississippi rivers, Iowa will find itself under water during the deluges that accompany the pole shift. It will take many weeks for the water to drain away, and due to the continuing rains, will find itself soggy for months and even years afterwards. 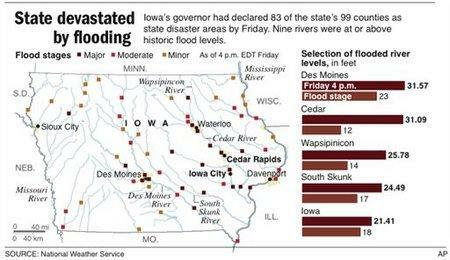 During the floods in June, 2008 Iowa surpassed the 500 year flood level, with major cities such as Cedar Rapids and Des Moines evacuated. Iowa's biggest cities were submerged Saturday after swollen rivers forced thousands of residents to flee their homes amid devastating floods in the Midwestern US state. A large swathe of Des Moines was underwater after a river levee was breached in the city of 200,000, and officials were concerned that a forecasted evening thundershower could bring raise river levels even higher. Muddy water from the Des Moines River covered several bridges and poured down streets north of the state Capitol, swallowing a neighborhood with about 200 homes and 40 businesses. At least 2,500 volunteers had registered to help hold the water back by filling and laying down even more sandbags under the hot sun. Unprecedented flooding covered hundreds of city blocks in Cedar Rapids, as officials urged residents to limit their water use to drinking, according to the municipality's website. The University of Iowa, based in Iowa City, cancelled classes until June 22 as the flood threatened its dorms, research facilities, library and art museum. Extreme weather has left at least 16 dead and thousands homeless in the state since May 25, said Bret Voorhees, spokesman for the Iowa Homeland Security and Emergency Management. Serious flooding has hit the entire region, including parts of South Dakota, Minnesota, Wisconsin, Nebraska, Illinois, Indiana, Kansas, Oklahoma and Arkansas. Rail shipments have also nearly ground to a halt in the state as floodwaters covered and even washed out track and key bridges and barge traffic on the Mississippi River was also interrupted. The power of the rushing floodwaters in Cedar Rapids was awesome. Houses and cars could be seen pressed up against a rail bridge which caught them as they were swept downstream.